Congrats 2016-2017 ART STAR Winners! 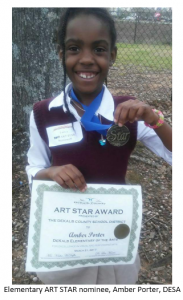 Home/News, Parents, Students, Trusted News/Congrats 2016-2017 ART STAR Winners! The DeKalb County School District (DCSD) has announced the winners of its fourth annual ART STAR awards for visual and performing arts. The ART STAR contest is open to all kindergarten through grade 12 students in DCSD. Students were nominated by district teachers, with the winners honored at a special event in March. One elementary, middle and high school student from each of the district’s regions were selected, as well as one district-wide performing arts star for the 2016-2017 school year. The winning works will be displayed in the lobby area of the Administrative Instructional Complex, with two-dimensional and three-dimensional art work rotated quarterly. The art work includes pottery, painting, pen and ink, and mixed media work.